This Malbec was sampled during a recent dinner party and proved popular with our tasters. 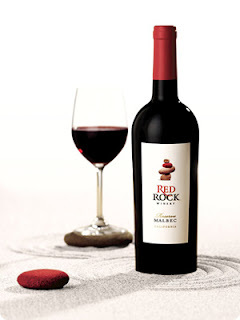 Red Rock is a Healdsburg, California, winery that sources grapes from throughout the state. This is a very round, fruity wine. We decanted it and cherry and berry flavors really poured out. This California Malbec is less complex than mid-level Malbecs from Argentina or pricer Malbecs emerging from the Northwest. Although pleasantly smooth to sip, it could benefit from some tannins to give it a kick in the pants. I wasn't able to find much information on Red Rock. The winery produces two wines, the Reserve Malbec and the Reserve Merlot. There is no indication of what qualifies the wines as "reserve." Another irritation is that the winery states that "winemakers blended a few different varietals into our Malbec." Well, what are they? I would guess that Merlot contributes to the wine's silky finish. It is value priced at about $14. Red Rock delivers a straightforward but crowd-pleasing vino.